We are leading manufacturer and supplier of Wedding Saree. Keeping in mind the diverse requirements if our clients we are involved in offering a wide range of Wedding Sarees. These are designed by our highly skilled fashion designers to meet the clients demands. 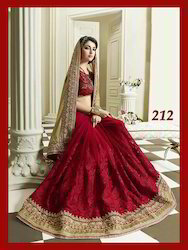 The most traditional Fashionable Lehenga that's original Indian Fashion. Saree symbolizes the adorn and beauty of the Indian women. Indian Lehenga Saree adds absolute grace and elegance to a woman's body which cannot be matched with any other dress. This exotic bridal saree creates the most stunning impact in this ribbon work extravaganza. The vibrant colour contrasts, rich pattern adds grace and beauty to the bride. Our expert craftsmen have embellished the saree with sequins for a dazzling look.